Sign Brackets By Street Sign USA! Street Sign USA offers a wide selection of brackets, fasteners and mounting hardware specifically designed for the sign industry. We carry virtually everything you need to professionally finish your sign related projects! Mount your signs fast & easy with our line of brackets. 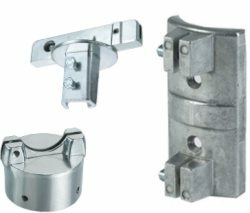 Brackets & straps to fit round, square and uchannel posts. Items for mounting to fences, telephone poles, 4' x 4's & more.